"The launch in the UK of Lurisidone began in August 2014. 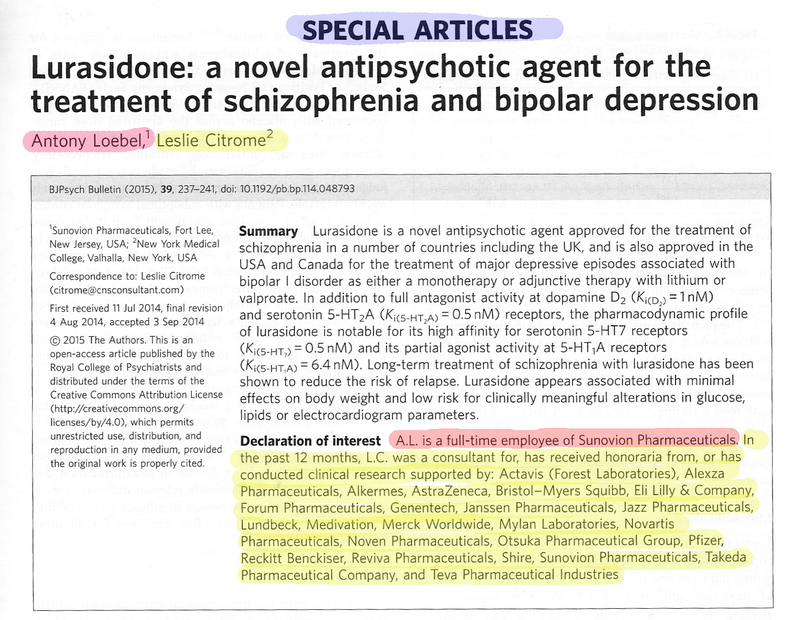 My previous post on Lurasidone (Latuda) which is now been marketed in the UK followed the financial interests of one of the authors of the “Special article” in the British Journal of Psychiatry. It has now crossed my mind, and here I must be very clear that I am speculating, that the British Journal of Psychiatry may have been paid to publish this “Special article”? It is welcome that this new medication has fewer metabolic effects than currently available antipsychotics. It is worth reflecting that, when the “atypical” antipsychotics were first marketed, they were promoted as having fewer Extra-Pyramidal Side Effects (EPSEs) than existing antipsychotics. It later emerged that the atypical antipsychotics had considerable metabolic side-effects. Here are the “References” provided by its makers Sunovion. There are several key authors of studies cited along with “Latuda Summary of Product Characteristics”. I have previously covered Leslie Citrome. Another study author is well known as a Key Opinion Leader, Professor Stephen Stahl. I recently posted about Professor Stahl after he gave keynote addresses to this summer’s British Association of Psychopharmacology Conference. 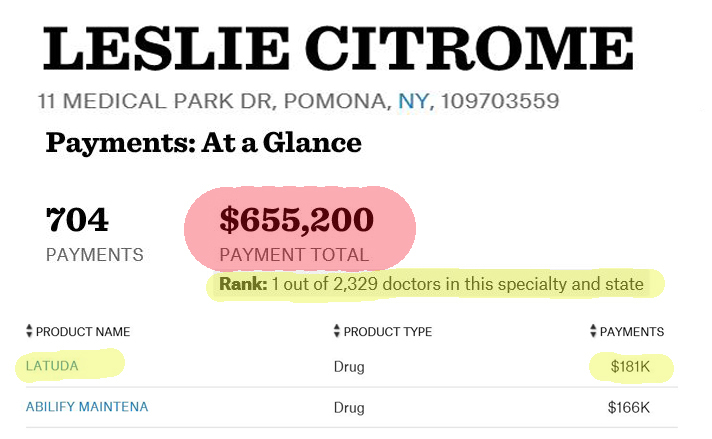 Professor Stahl’s payments dwarf the $181000 dollars given to Dr Leslie Citrome by the makers of Lutada. Professor Stahl’s OVERALL payments by 15 Pharmaceutical companies amounts to $3.58 million. Evidence based medicine should include all evidence. This should include all financial conflicts of interest in those developing, researching and promoting new medications. I do hope UK Psychiatrists are aware of all the evidence.